Free Next Working Day Delivery, If ordered by 2 pm. UK Mainland. The Armorgard OX6 Oxbox Truck Box a simple and dependable solution for securing tools and equipment. The OX6 Oxbox is a medium duty van box where the budget is under consideration. 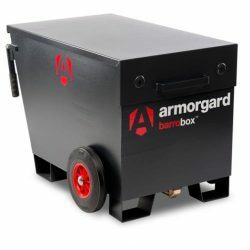 The Armorgard Oxbox OX6 Truck Box has retained some of the same features as fitted to the higher priced Strongbank and Tuffbank. These were the locks, hinges, gas struts and paint finish. 1. By creating extra folds in the vulnerable areas to maintain the necessary protection for your tools and protection. Armorgard holds in stock a vast supply of spare keys and parts for their products. Each product carries a unique serial number so the exact key can be located and dispatched to you immediately.